Filtek Z250 is a universal direct composite for anterior and posterior use. The composite is filled 60% by volume with 0.01-3.5μm particles. Contains: 20 x 0.20g unit dose capsules. 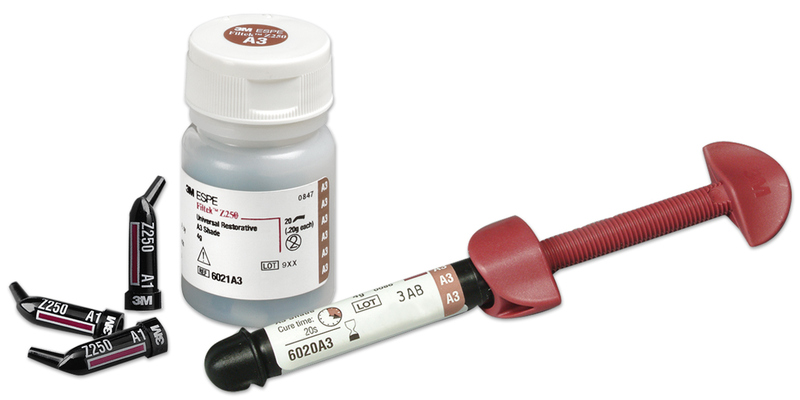 3M ESPE Filtek Z250 Universal Restorative is a direct universal composite for anterior and posterior use. The composite is filled 60% by volume with 0.01μm to 3.5μm particles. 565 Filtek Z250 restorations in 269 patients were evaluated during the recall period. Restorations ranged in age from one year to nine years. All classes of restorations were evaluated. Nearly half of the recalled restorations involved posterior interproximal surfaces. 94% of restorations recalled showed no chips or fractures. 4% had minor chips that required no treatment and 2% exhibited chipping that required refinishing or recontouring. No fractured restorations were observed during this recall period. Esthetics were rated very good to excellent in 98% of restorations. Filtek Z250 remains smooth and the color is stable. The material blends well with the surrounding tooth structure. The appearance of these restorations has rated consistently high for the past nine years. The majority, 88%, of Filtek Z250 restorations had no marginal discoloration noted at recall. While staining at the margins would be expected to increase over time, the ratings in this category have remained stable. Visual evaluation of wear of Filtek Z250 earned ratings of excellent for 93% of restorations. This composite is performing well not only in the anterior region, but also under occlusal load in posterior Class I and Class II situations. Filtek Z250 is a universal composite that has shown consistently high ratings for resistance to fracture, esthetics, resistance to marginal discoloration and wear resistance over nine years. It is an excellent choice for durable, esthetic restorations in anterior and posterior teeth.